You might have heard of the Elephone S7 smartphone by now. The device is Elephone’s new flagship handset which looks the Galaxy S7 Edge a little bit but costs way less. The Elephone S7 is available for purchase through Chinese resellers, and even though the phone does look very identical to the Galaxy S7 Edge, it seems like some people are interested in purchasing it, mainly due to its design. 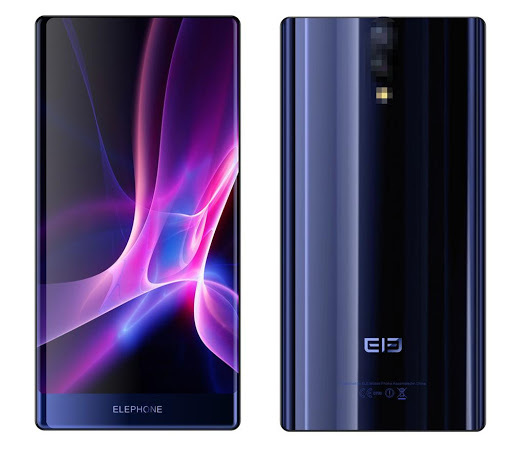 Speaking of which, Elephone is planning to release yet another really sleek-looking smartphone in the nearest future,. few hints from the Xiaomi Mi Mix as this is a bezel-less device, well, sort of, it sports some bezel below the display, it has the so-called ‘chin’ with the company’s logo. Needless to say, the phone looks really nice because of this, and its edges are curved, which means that it has a curved display as well, and the same goes for the back of the device , which suggests it will fit in your hand quite nicely. If you take a look at the back of the device, you’ll notice that there are two camera sensors placed at the very top of its back, and below them, the company plans to include an LED flash. Both camera sensors and the LED flash are blurred out in this render for some reason, so you don’t really get to see them properly, but we’ll probably see more Elephone S8 renders in the coming weeks. For now Sharp and Xiaomi are the only 2 companies who offer Triple-bezel-less display design and made great success. Soon Elephone will launch a better, stronger, and more exciting model with triple-bezel-less display. The preliminary design of this model is already complete, named of Elephone S8. However, the main feature of this model is not only the bezel-less, curved display or the lumia-wave, not the 128GB super large storage or the Deca-core processor. But the camera and the innovative fingerprint design. This time Elephone will be the FIRST one to make such design with that special design of fingerprint and cameras! What kind of smartphone will this model be? What exactly are the designs? Let’s make some predictions! According to another source, the S8 will feature one of MediaTek’s deca-core processors, and will come with 4GB of RAM and up to 128GB of internal storage, more than one variant will be available, similar to the Elephone S7. I don’t know if the company plans to include a fingerprint scanner here, but it’s not on the device. In any case, don’t expect this device to land that soon, the company just released their Elephone S7 handset quite recently after all, so you may have to wait a bit before the Elephone S8 lands. This phone will be quite affordable, though, just like the Elephone S7, so if you like the design of the Xiaomi Mi MIX, but are not willing to pay that much for it, the Elephone S8 might be a solution for you.